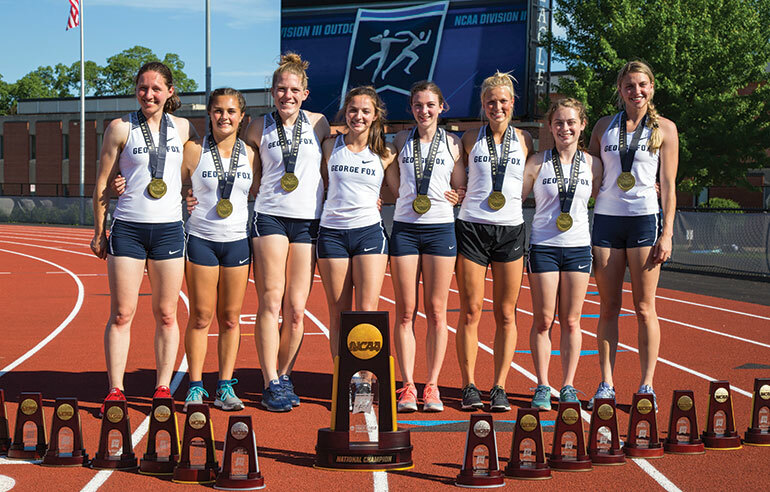 For the third time in school history, a George Fox team came home victorious from an NCAA national competition, as the women’s track and field squad hoisted the first-place trophy at the NCAA Division III Track and Field Championships in La Crosse, Wisconsin, in May, sharing the title with UMass Boston. The accomplishment follows the school’s D-III titles in baseball (2004) and women’s basketball (2009). Among the meet’s many highlights was the women’s 4x100-meter relay final. Juniors Sarah King and Lis Larsen, along with freshmen Kennedy Taube and Sara Turner, put the Bruins over the top in that event on the last day of competition. Their time, 46.55 seconds, broke their own school record set earlier this year and resulted in the first national championship for a relay team in school history. Every female athlete who had qualified for the national meet finished on the podium in at least one event. Junior Annie Wright earned a runner-up spot in the heptathlon despite suffering a hamstring injury that nearly kept her out of the competition. Meanwhile, senior Stacy Kozlowski placed third in the women’s high jump in her first national meet appearance. Senior Dakota Buhler placed third in the women’s long jump and fourth in the triple jump, while King took fourth in the 400 meters and fifth in the 200, both earning All-American honors. Also honored were coaches Smith (women’s National Coach of the Year), Gabe Haberly (Men’s National Assistant Coach of the Year) and Adam Haldorson (Women’s National Assistant Coach of the Year). Senior Seth Nonnenmacher ended his historic career as a Bruin by clinching his second straight national title in the javelin. 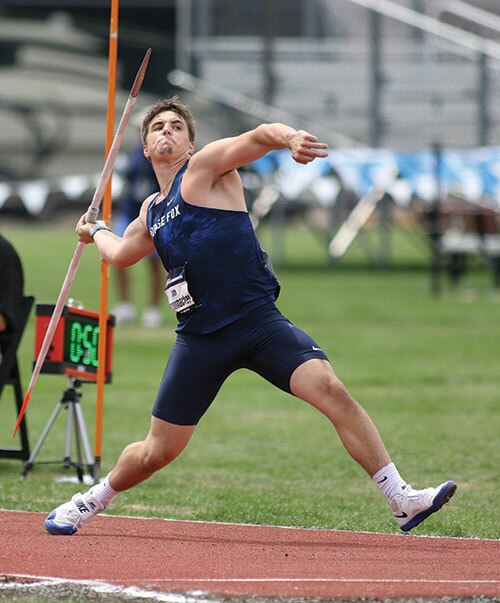 The All-American’s throw of 241 feet, 11.50 inches (73.73 meters) was not only good for a title, it was also the longest throw by any athlete in the Northwest across all divisions and moved him up to No. 3 all-time in the NCAA Division III record book. Nonnenmacher’s performance also qualified him to compete at the U.S. Track and Field Outdoor Championships, held June 21-24 in Des Moines, Iowa. Meanwhile, senior Alex Canchola wrapped up his collegiate track career as a national runner-up and All-American in the men’s decathlon. In addition, senior Vernon Lott, juniors Kenny May and Chris Polk, and freshman Brock Rogers finished fourth in the men’s 4x100 relay to earn All-American status. 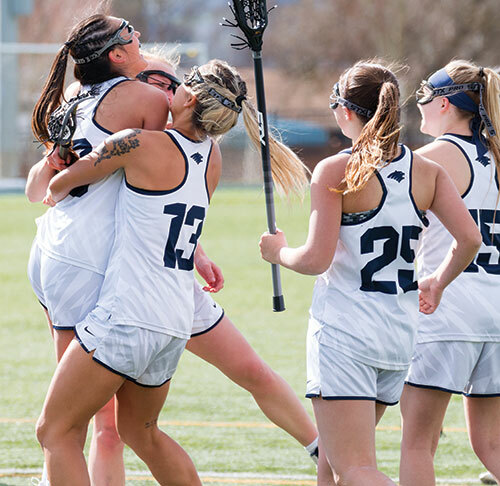 The women’s lacrosse team continued its dominant run in the Northwest Conference, winning a third consecutive NWC championship after posting a second straight undefeated conference season. The Bruins shut out two opponents and posted a 15-goal average margin of victory in conference play. As a result, six players were honored with a first-team all-conference designation and two more made second-team allconference – the most in program history. Senior Jess Hanson was named Northwest Conference Player of the Year and became the first Bruin named to the Intercollegiate Women’s Lacrosse Coaches Association (IWLCA) First Team All-Region. Hanson is now in the running to be named to the IWLCA All-American team, among the most prestigious honors in Division III lacrosse. In her first year, head coach Katie Mastropaolo led the Bruins to an 11-2 overall record and was named Northwest Conference Coach of the Year. The women’s golf team added yet another NCAA trophy to its growing collection with a third-place finish at the NCAA Division III Women’s Golf National Championships in May. This year was the Bruins’ ninth consecutive appearance in the national tournament and third straight top-three finish. They also shared the Northwest Conference championship, marking the ninth consecutive season the squad has won outright or shared the title. Nationals were the final chapter in the Bruins’ memorable season. Going into the tournament, the team was ranked No. 1 in the nation and recorded a Division IIIbest seven tournament wins for an overall record of 49-1 against Division III opponents. 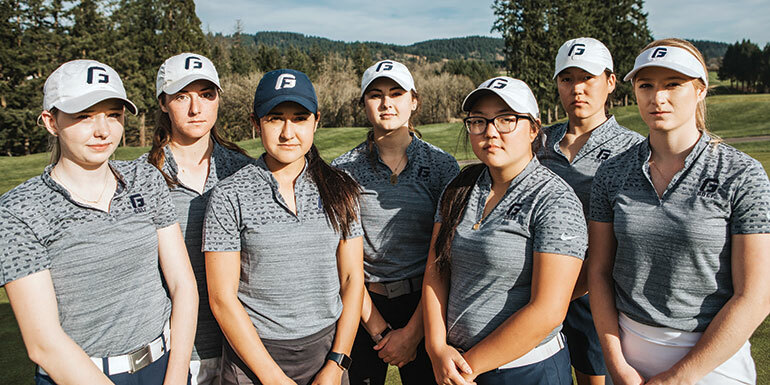 Senior Kristin Elich was named to the Women’s Golf Coaches Association (WGCA) All-American team for a third straight year, and junior Iris Kawada was a WGCA All-American honorable mention selection. Elich, Kawada and freshman Kayle Hunn were also WGCA All- Region team selections. In addition, Elich was named Northwest Conference Player of the Year, and five Bruins earned All- Northwest Conference recognition. 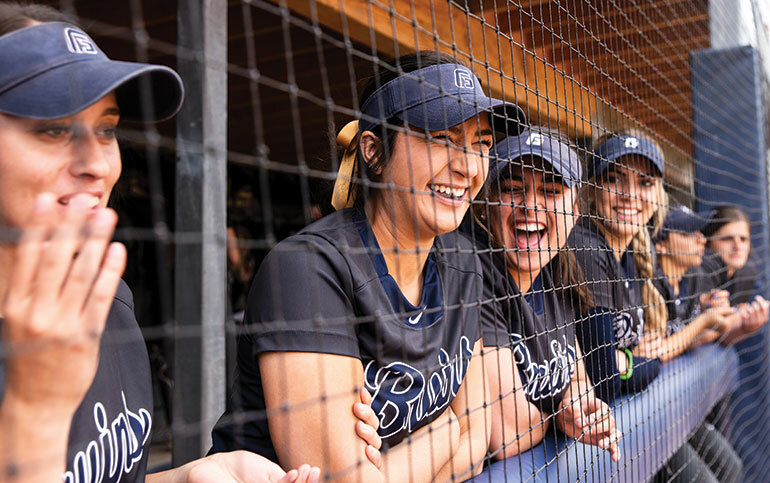 It was a landmark year for Bruin softball, as the team earned a Northwest Conference co-championship, finishing tied with Linfield College. The Bruins went on to make an appearance in the NCAA Division III National Championship Tournament for only the second time in program history. Throughout the season, George Fox rewrote the school record book. As a team, the squad set the record for single-season wins (35), while head coach Jessica Hollen recorded her 200th career win. In addition, senior Madison Sorensen set the school record for career wins, career saves and career strikeouts, and senior Annie Veatch set a school record for career home runs. Eight Bruins were All-Northwest Conference selections; Sorensen was named Northwest Conference Player of the Year; and Hollen earned Northwest Conference Coach of the Year for the third time. Additionally, sophomore Roni Braun was named to the NCAA Division III All- Region Team as a first-team selection – the first in program history. Sorensen was a second-team selection, and Veatch and junior Alyssa Gonzalez were third-team honorees. 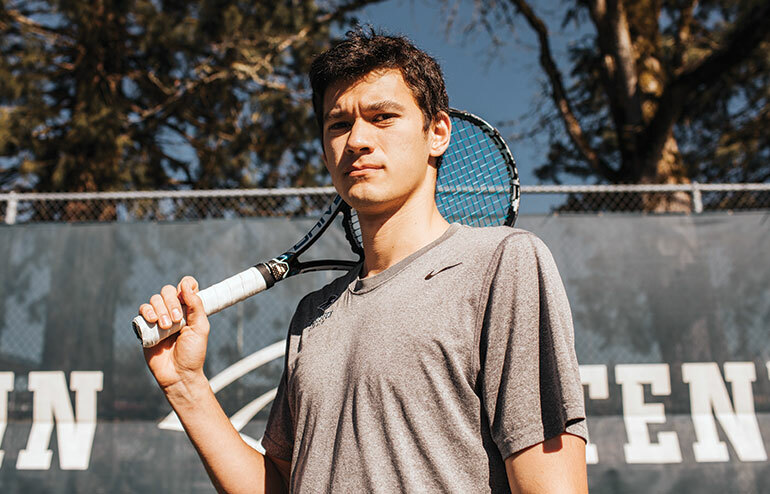 Senior Spencer Watanabe had already made George Fox men’s tennis program history as a three-time All-American, a four-time All-Northwest Conference firstteam selection, and as the 2017-18 NWC Player of the Year. In his final year as a Bruin, he capped off his stellar career with a historic berth in the NCAA Division III National Championship Tournament. Watanabe recorded some of his best career performances as a senior, finishing regular-season play with a singles record of 17-3 and a doubles mark of 13-3 with freshman partner Will Leach. Leach was named Northwest Conference Freshman of the Year. Watanabe, Leach and sophomore Alex Namba also competed in the NCAA Division III West Tournament. Watanabe’s performance in that event ultimately played a role in securing his spot in the national tournament.